The ES-250 first appeared in the 1940 Gibson AA catalog with the slogan: "Gibson has created the best electric guitar possible to make." This top-of-the-line instrument was an upgraded version of the popular ES-150. It had significant refinements which distinguished it from the earlier mid-range model. These included a larger body, a more deluxe fingerboard, headstock, tuners and tailpiece, and a bar pickup with individual mini-blades acting as separate polepieces for each string--for "maximum tonal reproduction." The most notable proponent of the ES-250 was the influential guitarist T-Bone Walker, who used it throughout the 1940s and early 1950s on many landmark electric blues recordings. It was also seen in the hands of Charlie Christian, Alvino Rey and Tony Mottola during the forties. 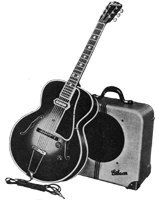 The ES-250, case, cord and the matching EH-185 amplifier cost $250 in 1940.